A vast readership wants better access to the ancient words and ideas of the Bible. 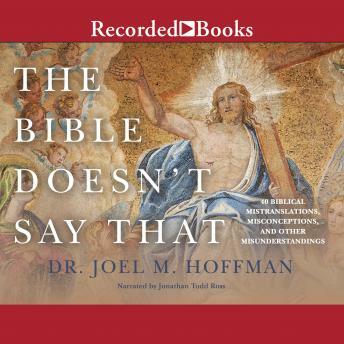 In The Bible Doesn't Say That, Dr. Joel M. Hoffman walks the reader through dozens of instances of mistranslations, misconceptions, and other misunderstandings about the Bible. In 40 short chapters, Hoffman covers fundamental theology, morality, lifestyle, and biblical imagery: *The famous New Testament quotation "God so loved the world" is a mistranslation, as are the titles "Son of Man" and "Son of God." *The Bible doesn't call homosexuality a sin, and it doesn't advocate for the one-man-one-woman model of the family that has been dubbed "biblical." *Jesus had siblings, in spite of the Catholic rhetoric about the "ever-Virgin Mary." *The Ten Commandments don't prohibit killing or coveting. Even many of the Bible's details end up distorted: the fruit in the Garden of Eden wasn't an apple, it wasn't a whale that swallowed Jonah, and many animals marched onto Noah's ark in groups of seven, not pairs. The Bible Doesn't Say That succinctly explains each misunderstanding, detailing the nature of what went wrong and offering insight into the original meaning of the world's most popular book.